And this, ladies and gentleman, is that product. Yoplait has a history of making yogurt flavors for women that are decadent/sinful/what have you but they love to brag about how good they are or they they’re losing weight eating it (you know that one, I can’t find it on YouTube at the moment). Apparently, it also prevents you for binging and purging. I did a marketing project in college dealing with yogurt advertising tailored towards women so I thrive in this stuff. On with the review. I grow mint in my backyard specifically for this reason. Since this is a limited edition product that came from a clearance grocery store, of course it ended up being the only one there. Research (Googling the product name) shows that there’s also a Pina Colada variety, somewhere out there in the grocery store wild. Apologies, no Jagermeister Yoplait for your alcohol enthusiasts. 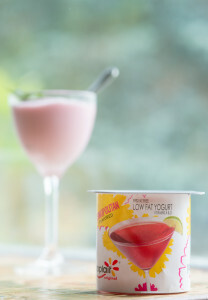 Mind you, there’s not actually any alcohol in this yogurt, but who wants cranberry lime yogurt when you can have Cosmopolitan flavor? AM I RIGHT, LADIES? Today’s product proves women can be wild and eat all the pink colored dairy product they want and still keep their figure. Side note: I love reading food marketing press releases. They’re generally pretty cheezy and I try to imagine a really enthusiastic pitchman (or in this case, probably a pitchwomen) reading this glurge. 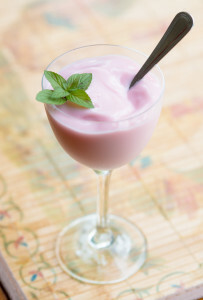 The yogurt is a tangy, tart oversweetened item. I mistakenly threw away the container that listed the ingredients so I’m unsure what gives it the alcohol-esque pucker so if someone could let me know the chemistry of alcohol flavored yogurt that would be awesome. I only ate a spoonful of one of the containers that came in my four-pack so I didn’t get the best value out of my yogurt purchase. Also I didn’t count the seltzer water I swished around in my mouth to get the flavor out. Please women of the world, just drink a Cosmo instead of scooping up this saccharin spatter. This entry was posted on Monday, June 17th, 2013 at 8:00 am	and is filed under Food. You can follow any comments to this entry through the RSS 2.0 feed. Both comments and pings are currently closed.